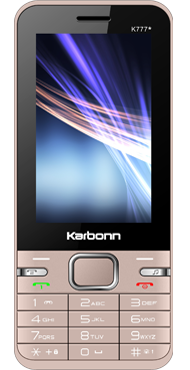 A product of Karbonn Mobiles announced years from now, Karbonn K777* has many features of a cellular phone that you want to have. A 1.3 megapixel camera you can use for taking pictures and video recording purpose. Supports GPRS for internet access, mobile internet browser Opera Mini, java applications and java games. With proximity sensor that is functional in changing your wallpapers, main menu page, games, music, videos and images by just moving your fingers.